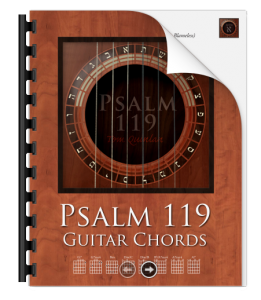 In 2007 I was inspired to begin writing music to “Aleph”, section 1 of Psalm 119, not dreaming that I would write music to the longest chapter in the Bible. But when I got to section 3 & 4, Gimel & Daleth, “I Am A Stranger On Earth,” and “I Am Laid Low in the Dust”, I got the idea to begin recording them. Instantly the music began to minister back to me in such a way that I began to consider all 22 sections a possibility. Almost a decade later I am still listening to it regularly, though not daily as I did for years. I still consider it a gift from the Lord. 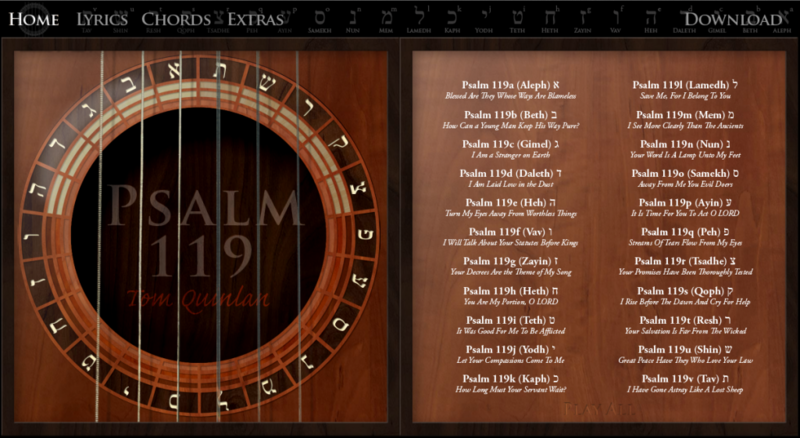 2010 UPDATE:Almost everything available on the old Psalm 119 pages is now included in the new “LP” version. [Not NEW any more and has been moved to the bottom of this page] Some links will take you to the old pages for now (for example: Charles Spurgeon’s Commentary: The Golden Alphabet) If you like the old version better, it’s still here. Click the image above to go to the new layout. Expect the first page to take about about 30 seconds to fully load as there are 22 images loading in the background for an effect I hope you find interesting. In 2012 I reworked these pages to be compatible with the iPad. 2016 UPDATE: Web technologies are changing very fast and the LP Version above has begun to break down in some browsers and certain functions have stopped working properly. In response to this we have added links below to listen and download all 22 parts of Psalm 119. Right click the titles to download. copyright 2007-2019 Tom Quinlan. Use for profit requires permission. Use for edifying the Lord’s body is granted freely. Psalm 119b (Beth) – How Can A Young Man Keep His Way Pure? Psalm 119k (Kaph) – How Long Must Your Servant Wait?